The white Canare Starquad XLRF-TRSM Cable (15') is handcrafted with the super flexible Canare L-4E6S cable and superior Neutrik XLR and TRS Phone connectors. Use Starquad for reduced hum and EMI, and no handling noise. 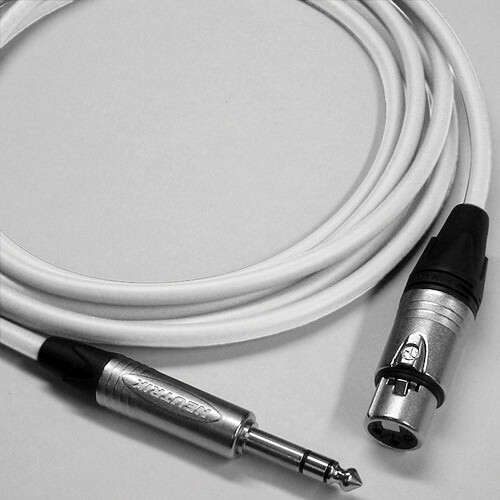 This cable is perfect for all microphone use and great for connecting balanced output of equipment to balanced inputs of some mixers, audio processors, and low density patch bays. Box Dimensions (LxWxH) 7.5 x 7.2 x 1.0"
Starquad XLRF-TRSM Cable (White, 15') is rated 5.0 out of 5 by 2. Rated 5 out of 5 by Kevin from Nice Cable - Love the Color This is a very nice cable, and I love the color options. The colors help me stay organized. Rated 5 out of 5 by Sal from Will definitely buy more. Great cable. Use them in my Recording Studio all the time.